You are here: Home » Featured » Developer Levels Offices, Pays $10M for Real Estate at 19th Ave. S.
Developer Levels Offices, Pays $10M for Real Estate at 19th Ave. S.
Buildings once housing Morris Higham Management, Dale Morris & Associates, and AEG/Messina Group Nashville have been leveled at the corner of 19th Avenue South and Chet Atkins Place. The assemblage of lots was purchased for $10 million to build a 344-unit apartment community by Lennar Multifamily Communities. The 19-story complex, called 19th & Chet, will be taller than originally expected since underground parking was not possible. 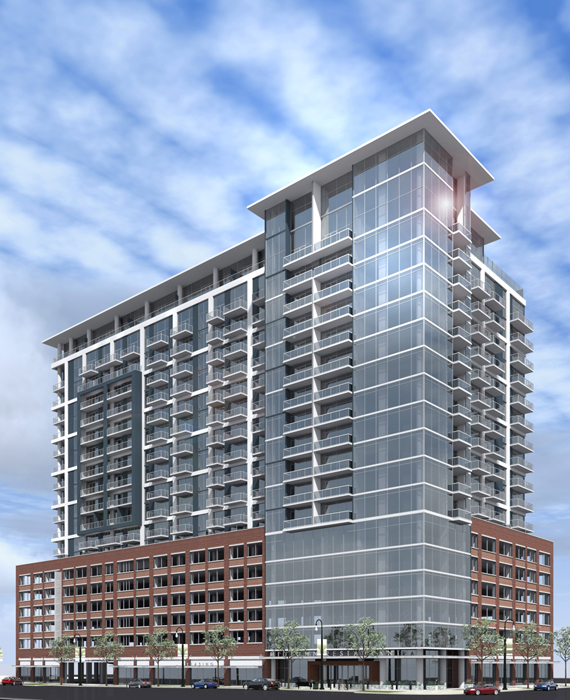 Apartments will occupy 13 floors above six levels of parking. For perspective, neighboring condominium, The Adelicia, is 18 stories. Morris Higham/Dale Morris now occupies remodeled offices at 2001 Blair Boulevard, which were purchased in early 2014 for $1.1 million. Phone numbers remain the same. AEG/Messina Group Nashville has moved to a temporary location at 1200 Villa Place, Suite 400.